The leaves are changing and starting to fall and there's a nip in the air most evenings now on the mountain top....and I couldn't be happier! It's finally here, it's finally Fall, Y'All! The light is changing, have you noticed it? It's definitely time to bring in the warm and cozy accents of autumn! 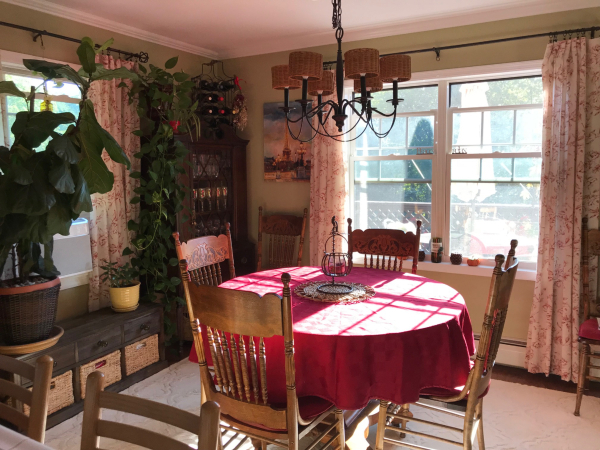 The dining room tablecloth is changed regularly as we eat most meals there, but the other morning this red cloth just looked so perfect with the sun streaming in through the windows - perfect spot for a weekend breakfast. 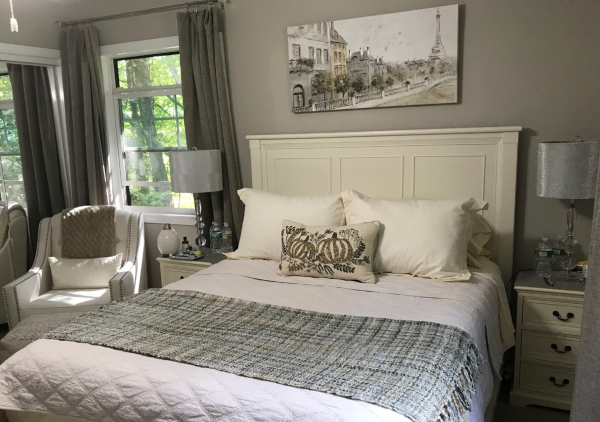 In the bedroom, I warm things up for fall by swapping out the yellow floral throw with this nubby grey tweed one, and a taupe fluffy throw goes on the chair in the corner. 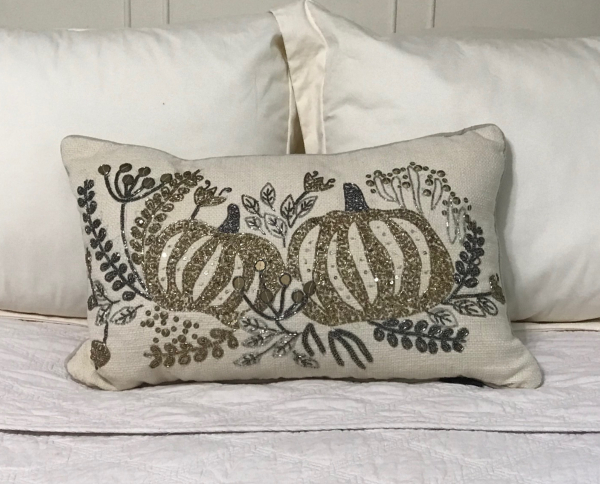 The white accent pillow gets changed to this lovely beaded pumpkin pillow. I got this a few years back in Home Goods, and I just adore it. The colors are always kept muted in this room to keep it tranquil, so this adds just the right touch of fall decor for my peaceful bedroom. 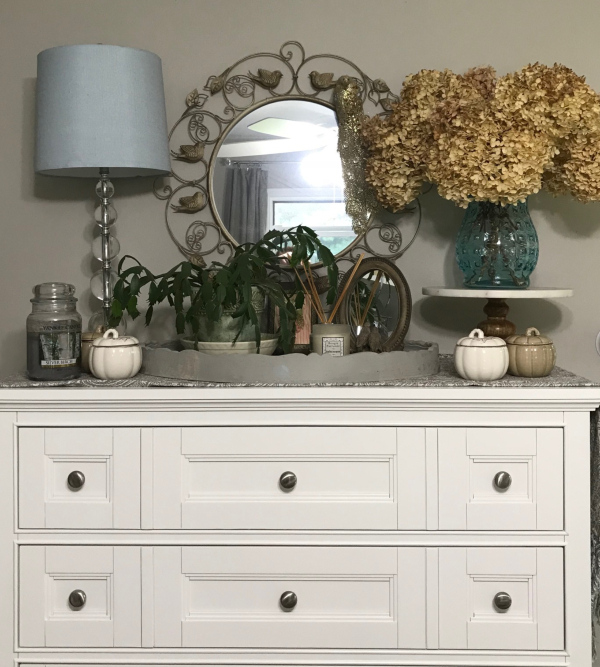 I also swap out the runner on the dresser - the one with the birds and yellow accents gets put away, and this grey paisley one comes out. The addition of a couple of pumpkin candles in muted shades completes the fall decorating in the bedroom. The cool nights mean I can leave my windows open for a breeze but close my drapes and make my room a cozy little cave, which I missed during the summer months. I admit I had a rather tough time getting up the first few mornings the drapes were closed! 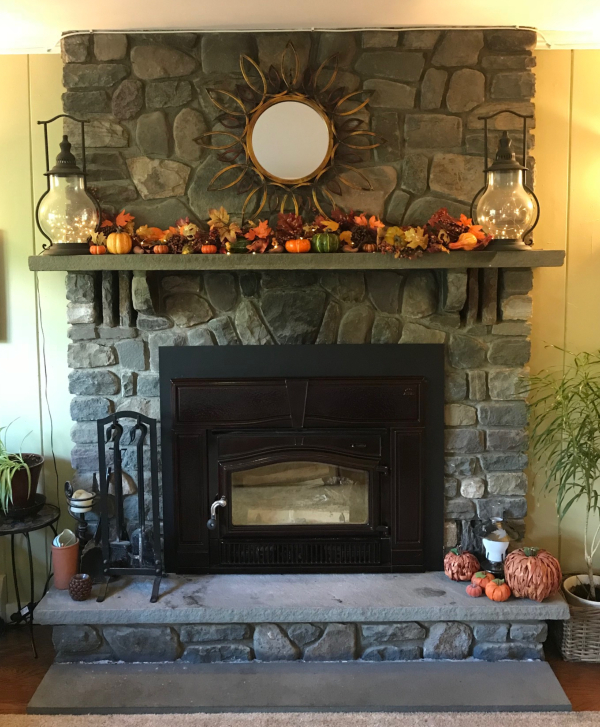 In the living room, the mantel and hearth have been decorated for fall, with a leafy garland and some random pumpkins and gourds. A few little pumpkins placed here and there add just enough of an autumn touch to make me happy. My oil diffuser is regularly pumping out a blend of orange, clove, and fir these days. The pillow covers have been swapped out with my fall collection. 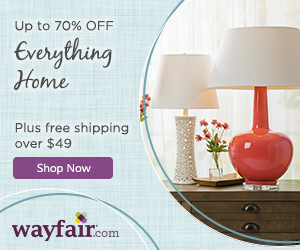 Those pillows with the leaves and the 'D' were one of the first things I bought when I put the offer on my house....Pottery Barn clearance, with a coupon code...my favorite way to shop! 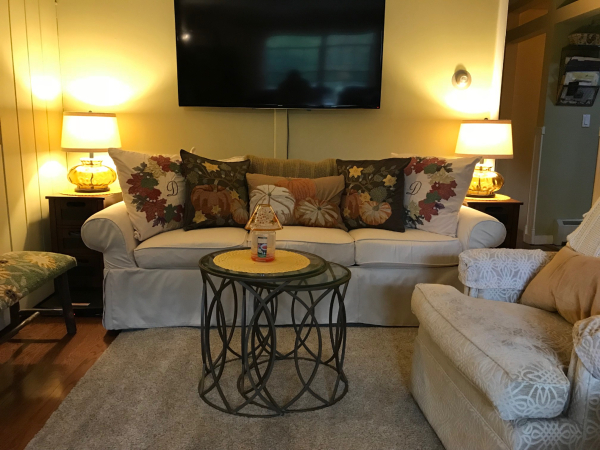 The following fall, when I was finally all settled into the house, I was so excited to bring out my fall pillows that I had collected whenever I saw a nice one pop up on clearance! They still make me smile. My old girl, Lily, has seen a lot of summers come and go - she's 16 now and just had a birthday. She doesn't get a lot of photo time on the blog as she's usually sleeping when the other two rascals are running around playing, but I couldn't help snap this photo the other evening - she looked so cute the way she was sitting. Poor sweet girl, she's full of lumps and bumps and aches and pains....we love her dearly and just try to make her comfortable. She'll be the one under my feet this evening as I am preparing a special dinner for Mom - it's always lovely to be able to make a nice meal for my Mom, and catch up on each other's lives. She doesn't like to cook, and I send her home with leftovers and meals I've frozen for her, to make things easier on her. Tonight we will feast on a whole roast chicken. I prepared it this morning, wrapped the pan in foil, and put it in the fridge. Tonight I just need to pop it in the oven and let it roast. I love when the house is cool enough to use the oven again - I really miss it in the summer months. 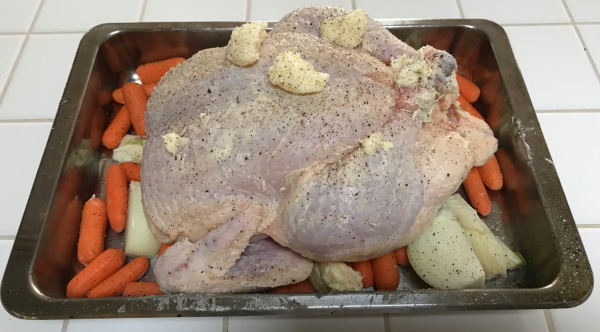 This is Ina Garten's recipe, with the chicken resting on a bed of carrots, quartered onions, and fennel, and stuffed with lemon, garlic, and thyme. It's such a simple recipe but produces the most fabulously moist, flavorful chicken! I will serve it with mashed potatoes, stuffing, and some of my pineapple chutney. What a perfect way to welcome in the first day of Fall! You home looks so beautiful and ready for Fall and cooler temps. That chicken dinner sounds amazing and soooooo delicious too. Enjoy your visit with your mom. Thank you, Marty - it was a lovely visit and a delicious dinner! I remember fall in western New York. Your home looks cozy and inviting! It's quite cool today, Penny - I had to actually wear another layer to work today and I love it! I have been wondering what oils would be good to diffuse now. Thanks for the tip. I love it when people have their dogs in a picture. To me it says real folks live in this beautiful house. A dog makes a house a home. Thanks for sharing. I love the combo of orange with clove, and sometimes also with fir or pine. 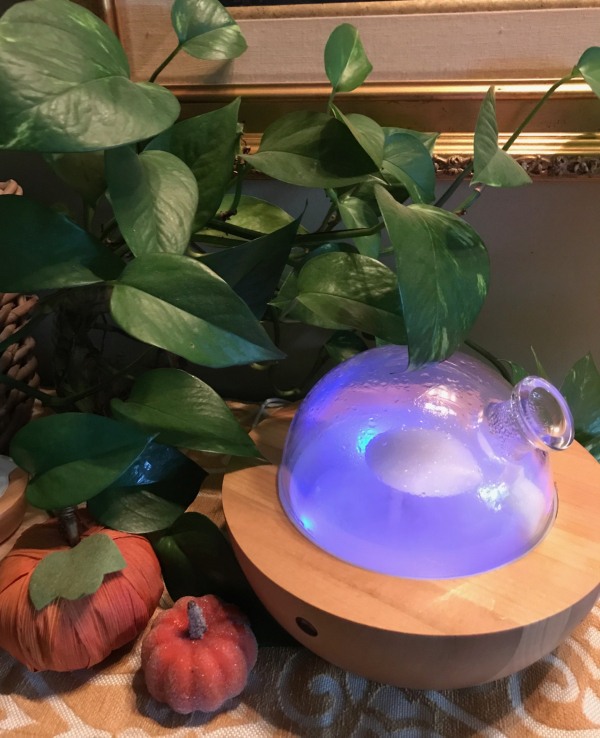 If you search online for fall diffuser blends you'll find loads of suggestions, PJ! 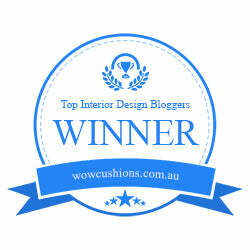 I absolutely love your bedroom! It looks so peaceful and so less chaotic than mine. I am attempting to calm ours down and gray may be the color I paint. Love your pillows for fall! Your dinner sounds wonderful too. Tonight will be meatloaf, Carole, and I'm pretty excited about that dinner also! 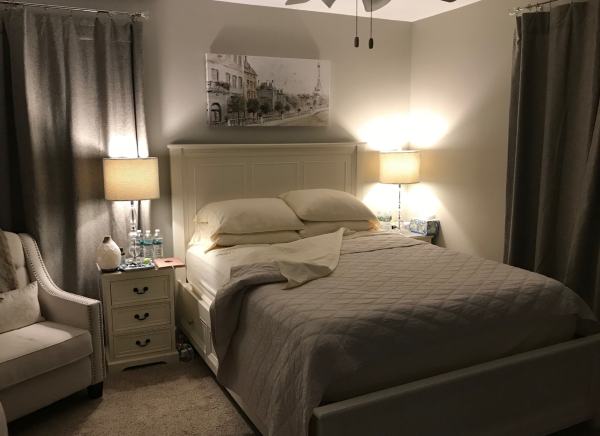 Your decorating is similar to mine in that I like color in the house, but my bedroom stays more tranquil with muted colors. Aww, Lily...bless her heart. She's such a pretty fur baby. My Zippo (kitty) is 19, so he sleeps a lot, too and has some medical conditions - but he's thriving and not in pain and has a healthy appetite. That roast chicken looks delicious. 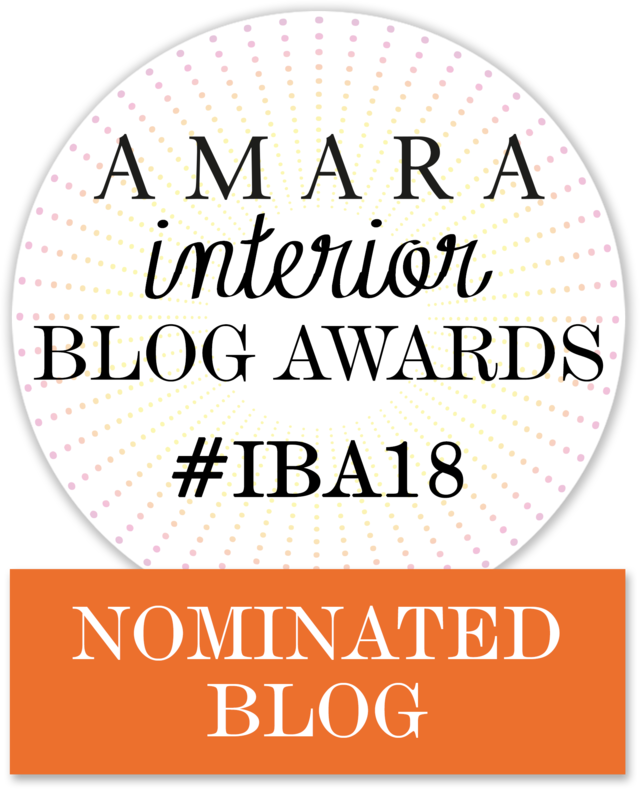 I love Ina - she's my favorite celebrity chef! How sweet of you to make extras to give to your mom. I'm always tucking away single serve dinners in freezer containers for Mom, Melanie - if I make something I think she'll like there's always enough to share, right? It makes her life a little easier not to have to think about cooking. You're such a sweet daughter. I know your mom appreciates that. Ha ha she might argue with you on that one, Brenda! I'm in love with you and your puppies and your house and your cooking..... I havent decorated for fall this year. We are selling our little home for a smaller one with a smaller yard. I miss decorating. Fall is my favorite, even over Christmas decorating. I love that it is fall and fresh apples and fall festivals and craft show. 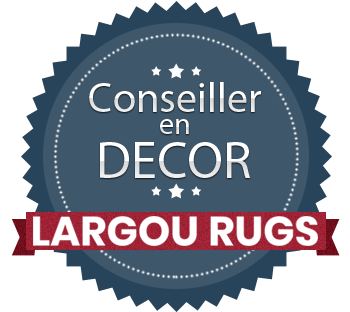 Next year, I'mma gonna decorate with a bang. That's a good plan, Cindy! If I were you I'd scout out the sales after the fall decorating season is over and pick up a couple of new things for your new home - you'll be so excited to pull them out next fall in your new place! Happy fall, Debbie. Your home is so inviting, and looks so nice dressed for cooler weather. Lily's a sweet baby dog. She is a sweet baby, even at 16, Rita. She has good days and bad, but her appetite is still good so that's a plus. 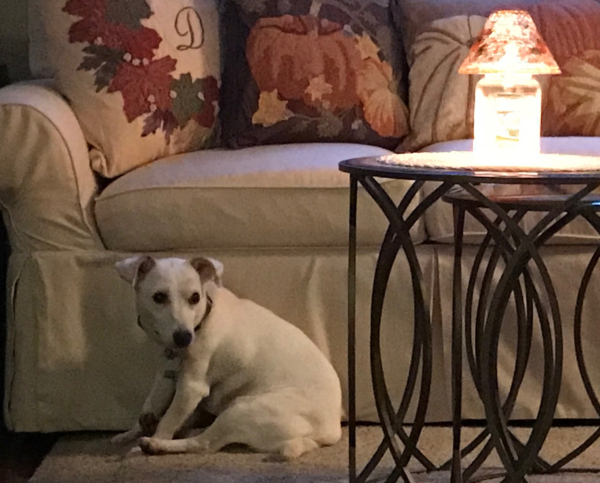 Poor girl couldn't get up the stairs this morning.....that is, until she heard the cookie jar, and then all of a sudden everything changed! I love that beaded pumpkins pillow! But even more than the pillow, I love this sweet picture of your Lily. I know how you are treasuring this time with her. She doesn't really look 16 in the picture, she looks so well cared for. I honestly haven't been in the mood to do much fall changes, not with Nashville having a record breaking 97 yesterday but your beautiful and subtle fall changes makes me want to. Yes, I too hope it will be oven time here soon! Nothing better than a roast chicken and if I know you, that carcass got saved for broth making, right? Richest broth ever! You better believe I saved that carcass, Dewena! I made broth with it, and we had terrific chicken noodle soup last night with freshly baked biscuits! Everything looks cozy and comfy for fall in your sweet home. That dinner you shared with your mom looks really delish. I bet your whole house smelled so great. Nice to see your sweet Lily. We picked up our sweet new little guy today. He is too adorable. Very shy and quiet. I think alot of it is he is overwhelmed to this new journey. He left a home with 15 doggies and now is alone with just us. He is a love and loves to be cuddled. I hope in the next few days he will learn this is his new home and start to settle in with us. Have a wonderful weekend. Oh I'm so excited to see your new little sweet baby settle into your amazing home, Kris! What a cutie pie he is, he'll complete your home just the way Cooper and Peggy did! No frost yet, but possibly next week - the temps right now show a low in the 30's a couple of nights, but that can change in a heartbeat! And I bet she was right, Susie, I bet you did wish you had leftovers!!! I always send Sweetie home with leftovers for his lunch, and when Mom's here she gets leftovers too....plus I freeze meals for her when I cook something I know she'd like, to give to her when I see her! It is time again to decorate for Fall so I appreciate the inspiration! I too am looking forward to cooking in the oven and baking all the apple and pumpkin recipes I crave this time of year. Beautiful post! Your Lily is just so sweet. My daughter made the best apple crisp last night, AnnMarie - she used a Bisquick topping and apples she picked with her boyfriend on Thursday - it was absolutely incredible, and the smell in the house was heavenly! Oh fall in the mountains...with a chicken roasting in the oven. I bet your whole house smells great. It's exactly what I picture when I think of fall. Lovely! It did smell great, Kim, I absolutely love the smell of roasting chicken....while it's roasting. When I'm done cooking I can't stand the smell left in the house, but that's where my diffuser comes in! everything looks so warm and cozy - perfect spot to enjoy fall on the mountain. We'll need warm and cozy this weekend, Karen - the temps are going DOWN!!!! your decorations are perfect! No leave turning here yet in the Carolinas! We are still in the 80’s! We hit nearly 80 yesterday, Lisa, it was so weird! Love the fall touches everywhere. Fall is my most favorite times of year...all the colors are gorgeous! The chicken looks delicious! Like you, I like it when the weather starts changing so that I can bake again. 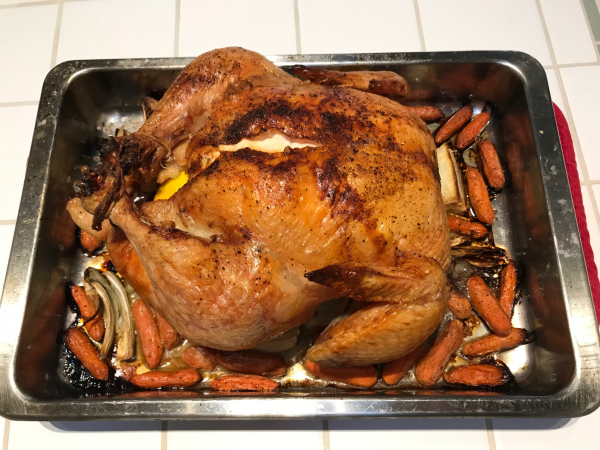 We roasted much like that chicken here in Texas this summer but temps are finally cooling down a bit. Love and hugs to you! I don't think I could stand the temps in Texas, Benita! This Irish white skin would crinkle up like a baked potato skin! Everything looks so comfy and cozy, just what we all want for the colder weather heading our way. I've printed the chicken recipe off and hope to make it soon. I feel for Lily because our one granddog lived to 16-17 years old. She was so full of lumps and bumps. Hugs to you and your all your furbabies!